Testers loved the all new Nexo Lyt 110 W G for its borderline narrow fit in the heel and ankle pocket with a slightly more relaxed and contoured medium width wrap on the forward part of the foot that combined to hold it all in a firm but well-padded grip. They gave it highest scores for both quickness and edge power, but they also dug the Liquid Fit liner injection technology for how it further customized the fit of the rearfoot in minutes. Testers said that the upper cuff tapered from an open and well sculpted boot top that would accommodate a thicker calf, down to a super slender boot throat just above the ankles. Some testers found this fit uncomfortably snug and suggested that a Form Fit shell molding session would be in order for them. The well-matched shape of the lower boot around the foot was testers' favorite Nexo Lyt fit element, which they said was pretty well set out of the box, but those who went through the Liquid Fit injection process all agreed that it got even better. Testers found the Nexo Lyt to be, well, light! But they also said the edge power was top tier and had a damp, stable feel on hard snow and higher speeds that may be attributed to the Graphene powder additive that is mixed into the polyurethane injection. 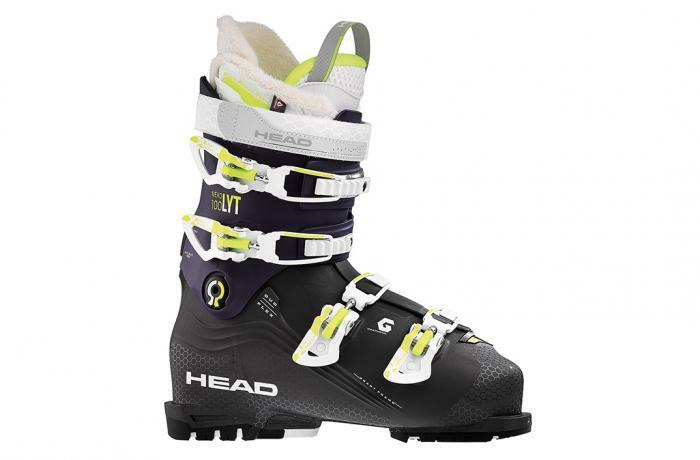 Testers mentioned the snug, performance medium fit around their feet equated into high quickness scores, but the thinner shell construction gave the Nexo Lyt 110 W G a closely connected feel, from foot to ski, they said. Some testers found the flex feel against the shin incongruous to start, but mentioned that Form Fit shell molding and Perfect Fit liner molding made improvements there. So, new this year for some Head boots (Nexo Lyt, Kore, Vector) is the Liquid Fit liner. The ankle and heel area on both the medial and lateral side of the liner has thin, hollow packets into which the yellow syrup-like stuff can be injected to better fill the natural void spaces there. We tested this liner customization extensively at the boot test this year and testers like the simple and intuitive nature of it—you wear the boot while it's injected and choose when to say, "When!" We found it easy to decide when enough was enough for a better fit in the ankles and heel, but just in case you overdid it, it can be easily removed. We did some long-term testing on the injected liners and found that the material did not sag or ooze out of place over time—pretty cool stuff. GripWalk soles are available as an accessory purchase.